Cyclists, there’s a new little gadget out there that’s going to help prevent accidents caused by insufficient light at night. And the best thing about it is that it comes with a USB stick. We’re talking about new USB bike light by Knog, a world-renowned manufacturer of quality cycling equipment, which makes gloves, bags, tools, and all other cycling necessities and accessories for bike lovers around the globe. 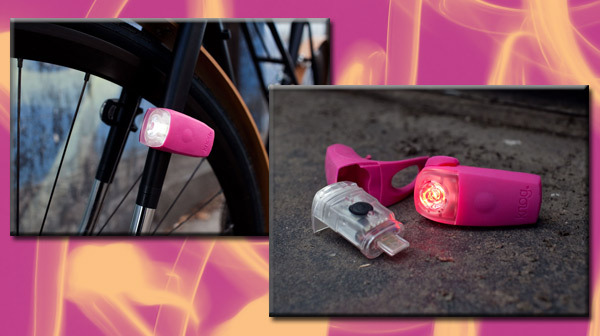 Coming in bright light colors, including hot pink, the Knog Boomer USB Rechargeable Front Bike Light has a high-powered central white LED which offers super bright output of up to 55 lumens for exceptional sight. The light itself features 5 useful modes namely, strobe flash, fast flash, random flash, constant on, and a storage mode for periods. These five are designed to accommodate any dark riding conditions for both the rider as well as other vehicles you share the road with. Sometimes going through a rough road can be tough and dangerous, but count on the Knog USB Bike Light to save the day. The device is totally water-resistant, and with its slim, flexible finish in an integrated silicone lens and housing, the Knog Boomer USB can easily be mounted to the handlebar without the need to use a mounting device. The Knog USB is equipped with a rechargeable lithium-ion polymer battery which offers a maximum of 12 hours of light for intermittent use or three and a half hours of steady use. More importantly, that also means monthly savings of up to $20 every month on those AA and AAA batteries! Just slide the unit out to reveal the flash drive of the Knog Bike Light and plug the USB stick into the port of your laptop or netbook. You’ll also be amazed with the device’s storage mode capability. When the light is not in use for several weeks, you can activate the storage mode by holding down the power button for 5 seconds after a full charge cycle. The LED will automatically turn off when the battery reaches the correct discharge level. Before using again, recharge the battery to full to maximize power. Here’s the only downside: the USB device does not support memory storage. It seems rather unfortunate and frustrating that a USB device with the appearance of a flash drive is not able to store files. Nonetheless, this device is still a favorite among those on two wheels. What do you think about this product? Do you agree that it should have at least a gig to store files? We welcome your comments! This entry was posted in Articles, Knog USB Bike Light, USB Devices, USB Gadgets, USB Stick and tagged Knog Boomer USB, Knog Boomer USB Rechargeable Front Bike Light, Knog Boomer USB Rechargeable Head Light, Knog USB Bike Light, Knog USB Rechargeable Bike Lights, Knog USB Rechargeable Boomer Bike Light, USB bike light by Knog, USB Stick. Bookmark the permalink.